What if the raccoons are stuck in a hard to reach place? If a mother raccoon has a nest of babies in the attic, the babies are helpless. The only ones who can remove them are the mother raccoon or a person. A good wildlife control operator should always remove the babies by hand and catch the mother separately. However, there are times when the babies are stuck in a place that is impossible for a person to reach. 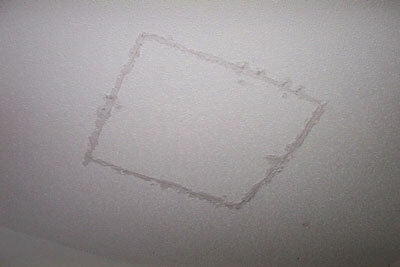 This photo series demonstrates a case in which the babies were stuck in a shallow area of an attic, right above a bedroom. A raccoon is small enough to crawl through this tight area, but no person could! 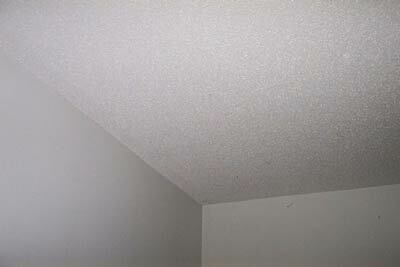 The babies are heard in the ceiling, in a location impossible to get to from within the attic. First I cut a hole right next to the exact area that I hear the sounds coming from. 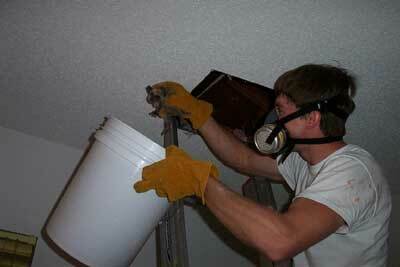 I carefully remove the baby raccoons, and wear a HEPA mask to protect against harmful pathogens. I place all the babies gently in a bucket. They may be cute, but they are noisy! I then fix the hole I made, securing it tightly and I spackle the edges. I placed the baby raccoons into a small metal holding cage, so that I could lure the mother. 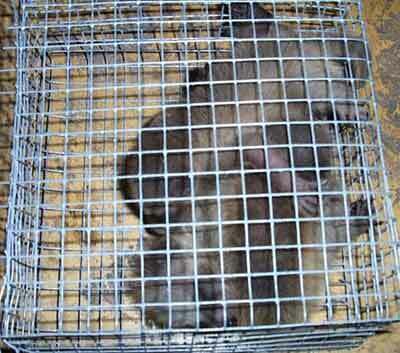 I place the babies inside of a white plastic box trap, which caught the mother raccoon quickly. 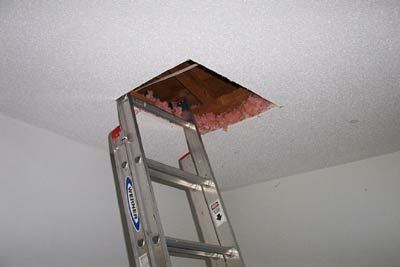 The job is not done until the entry hole into the attic from the outside is found and fixed. This heavy gauge screen will prevent any future animals from breaking into the attic. It is important that you be licensed in wildlife removal if you intend to handle raccoons in such a manner, and that you can legally relocate them if that's what you plan to do with them. 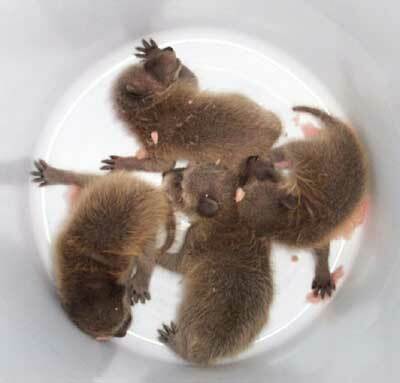 A nest of baby raccoons in the attic that are removed should be sent to a state licensed wildlife rehabber. You should be vaccinated against rabies before handling any wildlife like this. 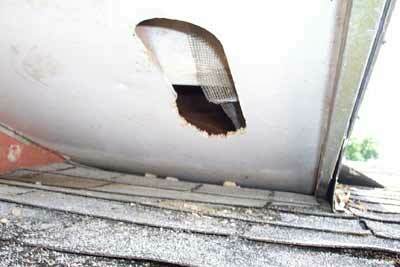 It is not easy to get raccoons out of an attic, and the work is best left to professional wildlife operators. Trapping raccoons in a nest in the attic. 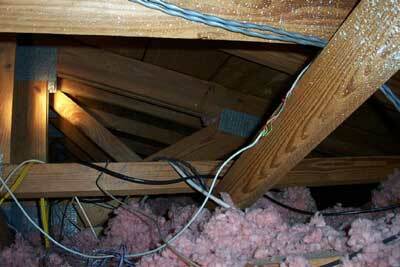 Attics are a favorite place for raccoons to make their homes; especially mother raccoons with their babies. Trapping raccoons in the attic is not always easy and special care needs to be taken to make sure that no raccoons are left behind. First, locate the raccoons� entrance and exit points and make note of them. If there are more than one place that they are using, seal up all but one entrance/exit route so that they will be forced to use only that one area. Most likely you will have a mother raccoon nest in the attic; you must first, before trying to capture the mother raccoon, capture the babies by hand. Wear protective gloves and hand pick up the babies and put them into a pillow case or some other gentle material that they won�t escape from or become hurt from too abrasive of material. You can then use the babies as �live bait� in a trap to lure the mother in as well. Traps should be set near the exit/entrance point they are using. For them to be effective and not risk hurting the raccoons or areas of your home, you may want to consider bolting down or tightly securing the trap to your roof. 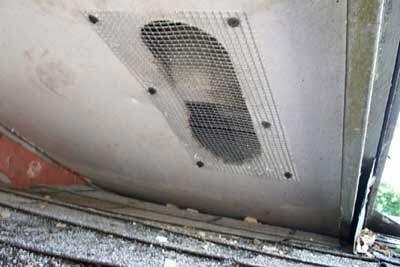 Make sure that there are not any wires or other materials within easy �paw� distance as raccoons can quickly destroy whatever they can reach through the cages. Raccoons and nests in the attic. Raccoons are not really known to actually build their own nests. Instead, they make their homes in areas that appeal to them for security, safety and food sources. Raccoons are known to make their nests in the cradle of large tree limbs, hollowed out trees, attics, barns, abandoned cars and even groundhog holes. A nest of raccoons can consist of a mother and her babies, or even an adult male raccoon with several young female raccoons. Discovering the nest is the first step in getting rid of raccoons. 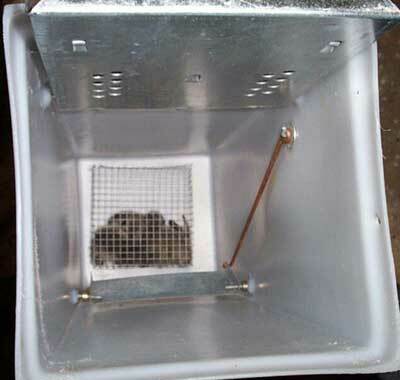 Depending upon the type of the nest, you will need to consider your options for capturing and trapping them. If the raccoon nest in the attic consists of adult raccoons only, then using traps that will �cage� the animals is the best option. Bait, such as marshmallows, can be used to lure the raccoons into the cage to prepare them for relocation. If you have a mother and her babies making a home in your attic or under your porch, you will need to first capture the babies by hand. Raccoons typically have about four young in a litter so make sure you have all of the babies before attempting to catch the mother. The raccoon babies can be used as live bait to lure the mother raccoon into the trap.